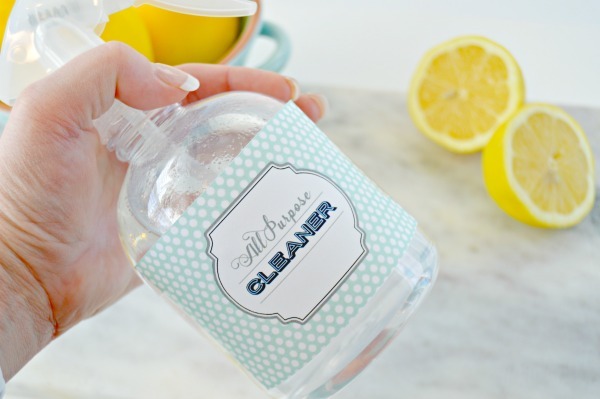 This DIY All Purpose Cleaner is going is so simple to make and will not only leave your kitchen or bathroom clean, but smelling amazing too! This post contains affiliate links to products I love. Making my own cleaning solutions is so important to me. 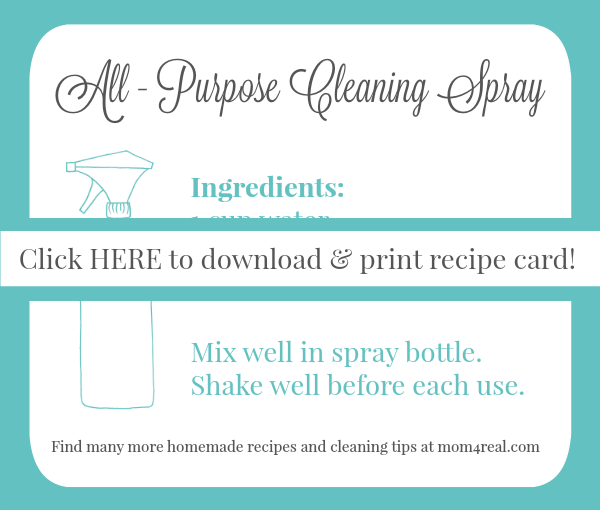 I love that I can clean my home using safe, non-toxic products, and I really love that I can control exactly which ingredients are included in my homemade cleaning products. This is one of my new favorite’s! I recently added it to my cleaning caddy, and have been using it to clean my kitchen and bathroom. You will need a spray bottle to hold your cleaner. I adore these clear plastic spray bottles! The first thing you will need to add to your spray bottle is 1 cup of water. Next, add one cup of distilled white vinegar. Then add 20 drops of lemon essential oils. 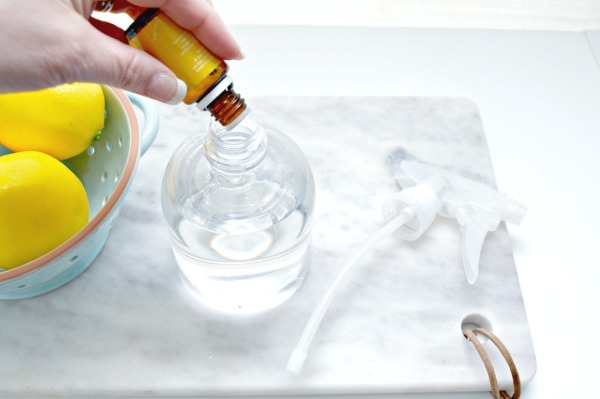 Place the top securely onto your spray bottle and shake well. I recommend shaking well before each use. 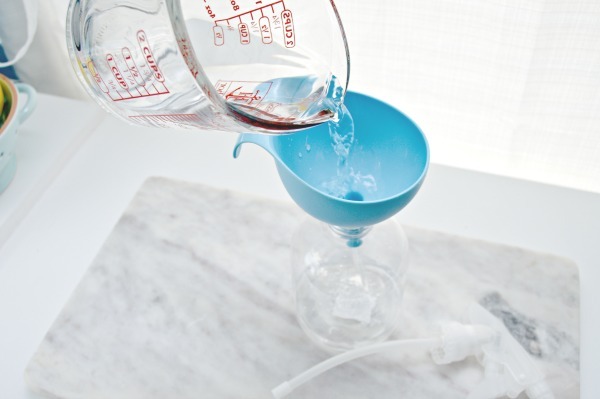 Because there are no chemical binders in most homemade spray, the ingredients can separate a bit between uses. A quick shake will fix this. Now, just spray your surfaces and clean as you normally would with a soft cloth or paper towels! If you would like to print out the recipe card above to save for your personal use, you can click HERE or just click on the recipe card above! 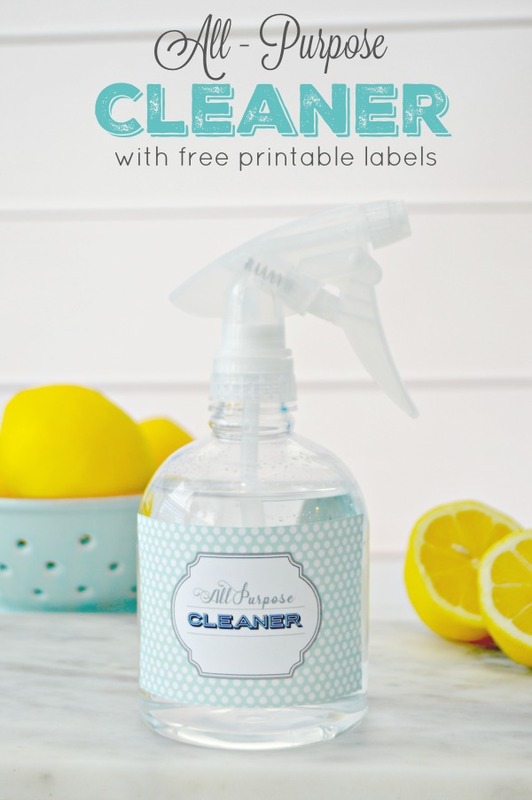 If you like my super cute labels, you can print them off yourself and add them to all your DIY Cleaning Products! I’ve even included a sheet of blank labels that you can use for whatever you like. To find and print them, click HERE! Find hundreds of my cleaning hacks and home tips HERE on my Home Tips Page! Love it thanks! Q: How long will this last once blended? To be honest, I just use mine until it’s gone…so around a month! Hope this helps! where did you get your funnel? I’ve had them for a while, but I think I bought them in the kitchen utensil section at either Target or Walmart. Hope this helps! Where do I get the Lemon Essential Oil at? Here is link to my shop. You can purchase the lemon oil there from Amazon if you like! Where is a good place to buy essential oils at a reasonable price?? Here is a link to my shop…there are a few in there from Amazon.com. You can also find them in some health food stores and pharmacies. Hi, I don’t have lemon essintal oil at the moment can I just use lemon? It’s probably better just to use lemon oil or leave it out completely. The lemon juice may be a little to sticky and your cleaner won’t last as long. Hope this helps! Is there a cleaner that will clean that sticky feeling on kitchen cabinets and drawers? 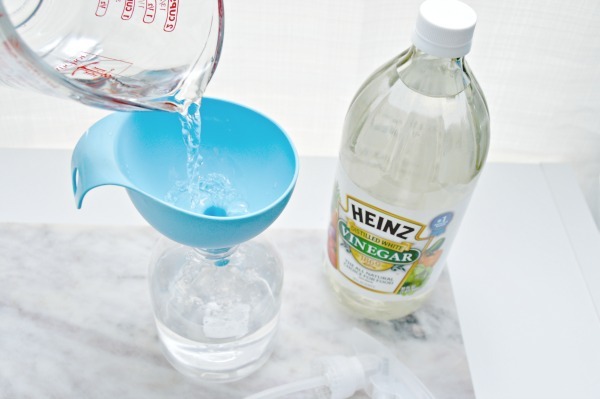 I have tried baking soda, vinegar, and others, nothing seems to work. It’s not dirty looking just sticky. Murphy’s oil soap is a liquid cleaner made to do this. I have no idea if you can duplicate this. I love your recipes and posts. I dont mean to correct you, but since citrus oils break down plastics and can cause chemicals in the plastic to be released into the solution, wouldn’t a glass spray bottle be a better option? I make a few cleaners as well but never put any into plastic bottles. Is this a safe cleaning product for granite countertops? I started making Jessica’s recipe using water, dish liquid soap and orange essential oils a year ago. I graduated from a small spray bottle to a large bottle. I use it for everything and love the smell. Not so fond of lemon. Her recipe I use kills flys and those darn ants. I make the recipe at least twice a week. Love it. Looking for a tub and shower cleaner besides the one for daily spraying. I lost the recipe for it. Pretty sure it used alcohol, and dawn and I’m not sure what else. It did a nice weekly cleaner while still using the daily.